· William “Bill” Grover Cleveland Riley was the sixth child and third son of Timothy W Riley Jr. and Mary Jane Cress. He was born in Bear River East on May 28, 1885, the same year that his name sake was elected president of the United States. It is likely that TWR, out of perhaps misplaced early admiration for the then Governor of New York who would be elected president in November, assigned the middle names to his newest offspring. · William is listed with the family as a six year old in the 1890 census, and again as a 15 year old in the 1901 census from whence his birth date is derived. In 1890 he shared the home with siblings George, Maggie, John, Lottie, Jennie, and Viva; Ida had previously died and Boyd had not yet been born. The 1901 census records only John, Jennie, Viva and Boyd as present with William in the Bear River East home. · As noted elsewhere, Mary Jane testified in November 1901 that she had left the family home in February and had made arrangements for John, Viva, and Boyd to live with her in her house-sitting situation at the Emerson Long home some two miles up the road. That the family is fully listed at the Bear River East home on March 31 suggests that either Mary Jane had her dates somewhat out of order, or Corey Long, the census taker, who knew the family well, simply listed that component of the family still living with the parents as being present and accounted for at the family home address the day of his census call. · Mary Jane in her testimony before the Justice of the Peace did not refer to making arrangements for William and Jenny to stay with her at the Emerson Long home. This likely means that these two children had been found accommodations in later 1901 with other neighbours. There is some possibility that William was staying with a Perkins family on the Clementsvale road. He apparently did stay there at some point in his youthful life and carried forward great admiration and respect for that family. · There is a reference in a community ‘news’ column in the Digby Courier for Friday, May 24, 1907 that William Riley of Clementsvale got his leg broken in a “scuffle” with another young man in that community the previous Sunday. This sounds very much like a couple of young men horsing around on a Sunday afternoon trying to impress the local young ladies when they were interrupted by a misfortunate accident. · William’s whereabouts at the time of the Canadian 1911 census is not known. Daughter Jennie Fahie indicated that her father had spent time in MA working in the ice delivery business with brothers-in-law Fred Millner and Bertis Floyd at some point before he enlisted in the army. The closest record to date is a 1903 landing in Boston of one William Riley, born 1885, who came from Yarmouth via the ship "President Arthur". That date would appear to be perhaps a bit too early to have worked with Bertis and Fred in the ice business. To date William has not been found in the 1910 US census either and it is quite possible he was not in MA in 1910. · According to daughter Jennie Fahie, William became involved in the apple picking business in the Annapolis Valley early in life. In 1913 he hired himself out to one Jeremiah “Jamary” “Jerry” Saulnier for the season and while there met the daughter of Jerry Saulnier and Mary Early, Clara Mae. Clara Mae appears to have been born in Beaconsfield, NS, on November 18, 1898, although the family was listed as living in nearby Hampton in 1901. In 1911 the family was listed as living in Beaconsfield where her census age was stated as 12 years. Clara May would have been some 16 years of age at the time of her marriage to 28 year old William in late-1914, not 21 as stated in the marriage record. · William Jeremiah “Jamary” “Jerry” Saulnier was of ‘French Shore’ Acadian extraction born in or near Plympton, NS in 1868, the eldest of at least three children born to Reuben and Charlotte Saulnier. In 1889 William married 16 year old Rachel Gossen in Weymouth, NS. The couple had one child Laura in 1890; Jennie Fahie indicated in 1999 that Jerry’s first wife died in in giving birth to a second child. Laura Saulnier married 40 year old farmer John Belliveau in St. Bernard, Digby Co, in 1911. Jerry was listed as a sailor in the 1891 census. · After the death of his first wife Jerry Saulnier proceeded up into the Annapolis Valley looking for work in the abundant orchards. Not only did he find work but also companionship as in 1894 he married Mary Early, the widow of Edward Bent, who entered the marriage with one daughter, Grace. o Grace Bent, born in NS in 1889, married George Kelsey in Bridgetown in 1908. The couple lived in the Three Mine Plain area of Hants County where they had at least two children, Anne Kelsey and Gordon George Kelsey. · Jerry and Mary proceeded to have three children, Charles William in 1895, Walter Reuben in 1897 and Clara Mae in 1898. After Mary died of a heart attack in 1906 Jerry married her sister Ella, whose family generated from Northfield, Queens Co, and who had been working in 1901 as a domestic servant in nearby Clarence, NS. The couple had no issue. · Jerry died of cancer, initiated as cancer of the lip ostensibly from pipe smoking, in April of 1919 in Beaconsfield, NS, shortly before son-in-law Bill returned from overseas service. Ella, warmly known as Nanny and with a strong religious holding, died c 1925 at her step-daughter Clara’s home. · Both of Jerry’s sons-in-law and both his sons enlisted in the Canadian Overseas Expeditionary Force during WWI: sons-in-law William Riley and George Kelsey joined up together in Sussex, NB, on Sep 17 and 15, 1915 respectively; son Charles initially joined up in Middleton in Dec 1915 but apparently did not ‘show up for work’ as required; he returned to the recruiting office for a second time in March of 1918 in Halifax and acquired a regimental number; son Walter also made a December 1915 commitment but was not officially signed on until Jun of 1916. George Kelsey was discharged as medically unfit from Halifax in March, 1916. · Bill enlisted as a private, regimental # 470379, in the 64th Battalion of the Canadian Overseas Expeditionary Force at Sussex, NB on September 17, 1915. His military enlistment documentation indicated Bill to have been 30 years and 4 months of age, standing 5’ 8” in height, having a medium complexion, with blue eyes and brown hair, and following the Methodist religious persuasion. · William spent at least some of his pre-overseas time in Halifax as he was admitted to the local military hospital for a week’s stay on the 20th of March 1916 with the mumps. Four days after his release from hospital he boarded the SS Adriatic (March 31, 1916) for transport to England where he disembarked on April 9, 1916. · Arriving in England Bill was assigned to the 5th Canadian Division Training Detachment as a heavy transport driver and bounced around between Shorncliffe and Shorham. Bill was admitted to sick bay in Shorncliffe for influenza on Jan 14, 1917 and was released on Jan 23, 1917; treatment was quinine in hot lemonade. · In mid-August of 1917 he was assigned to the 58th Battery of the Canadian Field Artillery in Wiltey from whence he was shipped to France on August 20th, 1917. In France he was reassigned to the Canadian Army Service Pool and then reposted to the 5th Canadian Training Division. o Court marshaled again on Feb. 20, 1918 for being drunk on duty and this time sentenced to 42 days confinement. · William appears to have successfully weathered army life for the remainder of 1918, including the end of the war on November 11, and the first few months of 1919. We next see him granted an 18 day leave of absence to the UK in mid February 1919. He was finally shipped back to Witley, England on May 11, 1919 from which base he left for Canada on June 18, 1919. · William was discharged on July 10, 1919 in Halifax as a result of demobilization of his unit. His weight at discharge was 140 lb and his health generally described as good. Just previous to discharge it was noted that he needed five fillings; it cannot be determined whether or not this dental work was completed before discharge. Daughter Jennie says Bill was always lean and lank and ‘walked tall’. · When he entered the army William’s pay was set at $1.00/day plus a field allowance of 10 cents/day. Of his total income some $20/month was assigned to his wife Clara, whose address was given as Bridgetown, NS, and was forwarded to her by cheque, directly by the military. By the end of May 1919 Clara had received some $760.00 in pay remittances from the Canadian Military. · Upon discharge William returned to the Bridgetown area and moved his growing family into a home which had been constructed for the family in Beaconsfield by his late father-in-law during Bill’s overseas tour of duty. William appears to have been blessed with a good work ethic and an abundance of work skills - he was initially employed in local apple orchards in season, and later worked in the cider mill in Bridgetown each fall and winter, worked in the woods, carried out some part time shoe repair work, and was involved in the spring log drive for the Mersey Pulp and Paper in the Liverpool area. It is said he could leave home in the morning, cut and pile 2 cords of wood, and be back home by 4 pm; he could also apparently pick a record 40 barrels of apples a day. · By the time of Bill’s army discharge his family had increased to four. The oldest Milton Herbert (“Herbie”) was born in August 1914 and daughter Jennie Mae in January of 1916, after William had joined the army but previous to his being shipped overseas in April. Beginning in the early 1920’s the couple had five additional children: William Alexander “Willie” (Feb. 1921), Ruby Kathleen “Kathy” (Dec. 1922), Charles Cleveland (Apr. 1925), Roseville Roscoe (born and died August 1926), and John Edward (Aug. 1928). · Clara Mae died of TB at an early 33 years of age in November 1931, leaving behind a relatively young family. Apparently William had contracted the disease overseas but was strong enough to resist it early in life and became an unintentional carrier. · Jennie Mae stepped in as surrogate mother for 18 months or so from her mother’s death until the three youngest were boarded out shortly before her Jan 1933 marriage. In 1932 Kathy, Cleveland, and John were billeted at a Mrs. Gertrude Elliott’s home in Clementsport and guardianship of the three was formally transferred to the local Baptist minister, Rev. Albert Prosser. · William continued at active seasonal employment until 1963 when he returned from the Liverpool log drive with a case of a cough and ‘the flu”. However, on closer examination it proved to be TB and, after a short stay in the Shelburne hospital, William was checked into the veteran’s hospital at Camp Hill in Halifax, and had part of a lung removed. At that time he effectively retired. Subsequent to his retirement William boarded with Annie Whitehead (? ), daughter of his stepsister Grace, at Three Mile Plains, NS. William Grover Cleveland Riley passed away of kidney failure in the Payzant Memorial Hospital in Windsor, NS on October 13, 1964. He is reported by daughter Jennie to be buried next to son Clarence in the cemetery at St. Croix, NS. · William and Clara’s first child Milton Herbert “Herbie” Riley was born in Beaconsfield, NS in August of 1914. After a stint in the Canadian army during WWII Herbie returned to civilian life in Nova Scotia and in 1949 married one Catherine (Amero) Potter, a widow with eight children and originally from Doucetteville, NS. Catherine’s husband had drowned along with two other local men in Mulgrave (Big) Lake in 1944. Catherine died in May of 1954 as a result of an aneurism suffered on the street in Digby. In early 1955 Herbie married Margaret “Peggy” Brown originally from Amherst, NS, and the couple proceeded to have eight children – Susan (1955), Deborah (1956), Donna Mae (1957), Nancy Lynn (1959), Margaret J. (1960), Steven (1962), Faith (1966), and Kevin (1969). · Herbie was a stone mason by trade and spent most of his post-war career working at CFB Cornwallis while doing some farming on the side. He retired from Cornwallis in 1962. In the early mid-1960’s he bought the original Timothy W & Mary Jane Riley property in Bear River East, selling it in 1966 to next door neighbour Kenneth Trimper. Herbert, following his passion, then bought a large farm on the north side of the Clementsvale road about halfway between the MJR home and Bear River. He suffered a heart attack in October of 1977 at his cottage at Bailey Lake and died in the hospital in Digby, NS. He is buried in the Clementsvale cemetery. Peggy died in Halifax in 1993 and is buried with Herbie in Clementsvale, NS. 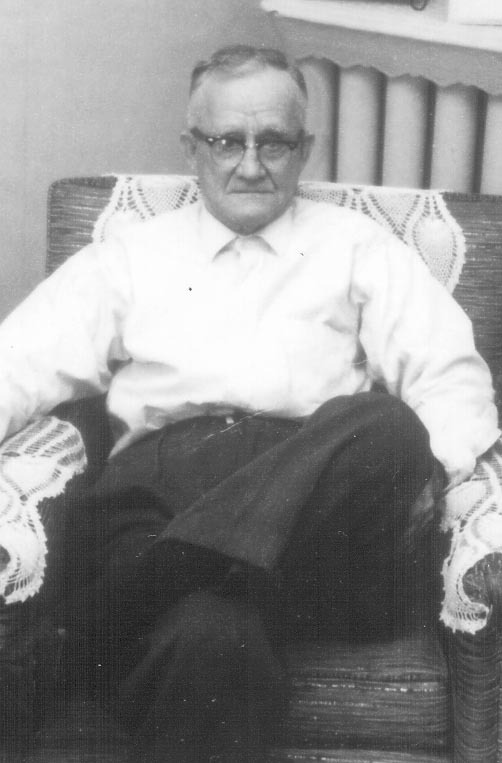 · Shortly after her 17th birthday in 1933 Jennie Mae Riley married Clayton “Buster” Gordon Wamboldt of Clementsvale, NS. The couple had two children, Leslie Albert in 1933 and Joycelyn Clara in 1941. Jennie Mae nursed her grandmother Mary Jane in Mary Jane’s Bear River East home for about 4 months prior to Mary Jane’s death in 1939. She and Buster divorced in 1952. In 1953 Jennie married Dartmouth transit driver Foster Fahie. Jennie worked for the children’s hospital in Halifax and later the Halifax Savings and Loan Company where she stayed for some 19 years until 1963. Foster retired after some 32 years with Dartmouth transit and in 1985 the couple moved to community of Moose River Gold Mines where Foster had lived in his youth when the mine was working. Foster passed away in 1996 after a two year illness triggered by aneurisms. Jennie continued to occupy the family cottage at the old mine site until 2007 when she moved to Texas to live with daughter Joy and husband. Jennie and Foster are buried in the Higginsville Cemetery in Halifax Co.
· William Alexander “Willie” Riley was born in Beaconsfield, NS in February 1921. Willie was deaf and beginning in 1930 attended the Nova Scotia School for the Deaf in Halifax where he completed his Grade 12 and took some training as a typesetter. After leaving school Willie made his way to Digby, NS where he spent most of his adult life. He established a successful ‘odd-jobs’ business in Digby and was renowned for his welcoming warm smile. He married one Josephine Dakin in Digby, who was also hearing impaired and worked at Tupper Warne’s sawmill as well as the local Steadman’s store; there were no children. Willie died of a heart attack in Digby in 1980 and is buried in an unmarked grave in the Clementsvale cemetery next to brother Herbie. · Ruby Kathleen “Kathy” Riley was born in Beaconsfield, NS in December, 1922 and would have been some 9 years of age at the time of her mother’s death. She was the oldest of the siblings boarded out at Mrs. Elliott’s in Clementsport, and as a result took on something of a mothering role in respect to her two younger brothers. She found the loss of John to adoption somewhat difficult and as a result searched for him without success for a number of years. Because of the boarding situation Kathy was able to finish her schooling in Clementsport and later in Annapolis Royal. After completing her Grade 12 she took employment with the Royal Bank of Canada in Annapolis Royal, securing an apartment above the bank; this allowed her to sever her relationship with Mrs. Elliott. Just after the end of WWII in December of 1945 she married returned Cornwallis naval officer Gerald Bradley in Lambeth, ON. The couple moved first to London, ON, and later to Vancouver in 1950 where Gerry was employed in the banking sector. In 1982 they moved to Mayne Island just off the east coast of Vancouver Island where they continue to reside in early 2013. The couple had three children: Paul Douglas in 1949, Judith Ann in 1952, and Jayne Kathleen in 1959. In 2010 Jerry and Kathy moved to Quesnel, BC where daughter Judith Ann was living; Jerry died in Quesnel in March of 2012; Kathy in May of 2015 at 92 years of age. · Charles Cleveland as a child apparently had a penchant for running away from boarding establishments, including Mrs. Elliott's in Clementsport and a second in the Kentville area; from the latter he walked all the way to sister Jennie’s in Clementsvale. He finally settled down as an older child with a farmer and his wife in the Granville area. When it was time for him to seek employment he made his way to Digby, NS and was engaged on the gypsum boats which transported gypsum from Nova Scotia to the US east coast and the Caribbean. The first love of his life broke his heart and simultaneously cleaned out his bank account, likely one of the reasons he never married. He, like his brother Herbie, joined the military during WW2; however, Cleveland received a dishonorable discharge for throwing a non-commissioned officer, with a penchant for picking on him, through the plate glass window of a Halifax pub. Cleveland was killed in 1956 while walking on a road near Windsor when hit by car whose young driver had been drinking. He had set out to retrieve a saw that was in for maintenance and that he needed for work the following day. He is buried in a cemetery in St. Croix, NS about halfway between Halifax and Windsor next to his father. · John Edward was the youngest of the three Riley children boarded out at Mrs. Elliott’s in Clementsport, arriving there when he was four years of age. At five years of age John was noticed by a visiting couple from NY who expressed an interest in adopting him. With the assistance of the good Rev. Prosser, who never advised the family as to what was happening, the adoption was consummated and young John was moved off to NY with his new family. However, shortly after the adoption the marriage floundered. John’s mother remarried, this time to a Mr. Wiechert, and the family eventually moved to the state of Washington. In the meantime sister Kathy was desperately trying to maintain contact with her younger brother, but was unsuccessful due to, it turned out later, both the name changes and the pointed intentions of John’s adopted mother. · John had always been interested in the sea and in 1945 at age 17 he enlisted in the US Coast Guard, intent on pursuing a career position. Sensing John’s potential the Coast Guard provided him with the necessary education, and John eventually entered officer ranks. For anyone with an active memory of the TV coverage of the Detroit riots of the summer of 1967 John was the driver of the military armored vehicle that received so much TV coverage as it moved along the Detroit River. John eventually rose to the rank of Lieutenant Commander in the US Coast Guard from which rank he retired in the 1980s. In civilian life he became an international expert in dealing with oil spills. · John married Marcia Hall in Nordland, WA in August of 1952. The couple had five children Cynthia (1953), Kathleen (1955), Carole (1957), Robert (1959), and Richard (1961). Through the efforts of John’s father-in-law and with the gracious assistance of the manager of the Royal Bank of Canada in Annapolis Royal John was reunited with his sister Kathy in July 1960, the siblings at that time living only some 40 miles apart on the opposite side of the continent (and the border) from where they had last had contact. John passed away from a heart attack in January 2001. · As a sidebar John’s youngest son, Richard Wiechert, was so taken up with his father’s family story that he had his last name formally changed to Riley. At the same time he and his wife were in the business of designing jeans and in the late 1980’s released a tough but attractive new pant under the brand name “Riley”. Half a continent away 2nd cousin Ray Riley discovered the product and, because of its quality, adopted it for casual wear, never realizing its connection to the history of his family and in spite of the jabs from friends about needing to have his name sewn on his pants so he would not lose them. In the early 1990’s the product line was eventually purchased by GWG and the brand name later retired.